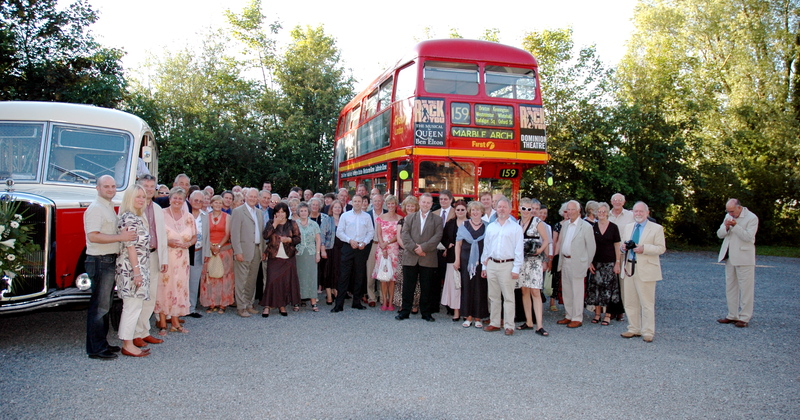 We frequently get asked why we have a London bus as our Twitter and Facebook avatar. The answer is quite simple. 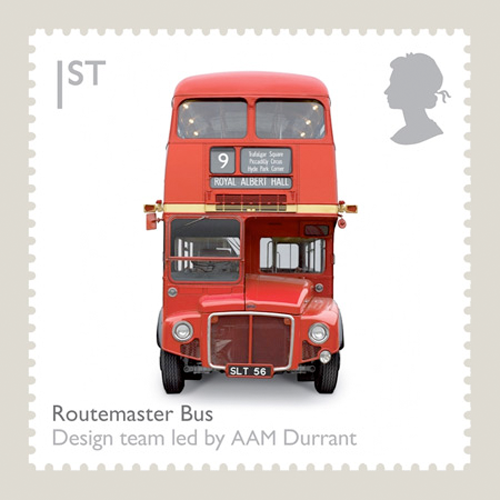 We own one, in fact the very one in the photograph – Routemaster RML 2352. That inevitably results in the next incredulous question: “What on earth do you want a bus for?” to which the answer isn’t nearly so straight forward. Admittedly it’s also slightly eccentric but we cope with that! The long answer is not only longer and involves a number of people to thank – or blame! – but probably only of interest to classic vehicle enthusiasts, so feel free to jump off here! Somewhat bizarrely – it must have been fate! 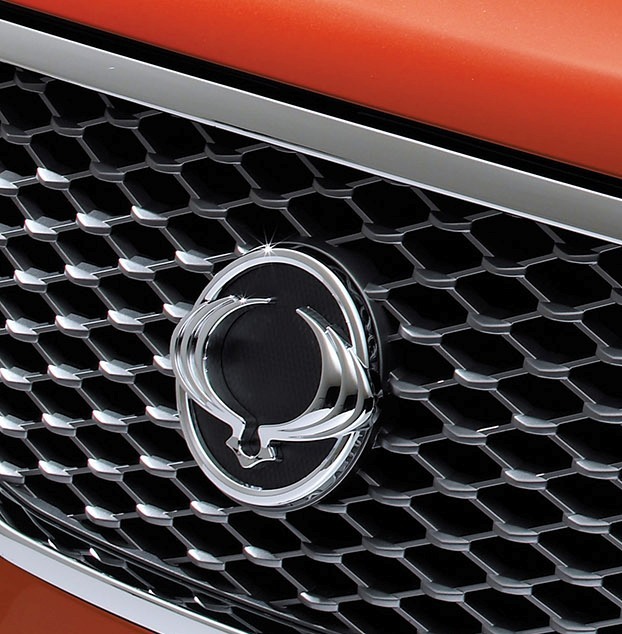 – a few days later I found myself sitting next to Brian on a table hosted by Andrew Didlick, PR director of Peugeot UK at the annual Society of Motor Manufacturers and Traders (SMMT) dinner. Poor man was quizzed ruthlessly, but he patiently answered my questions and confirmed just how easy it was to drive. 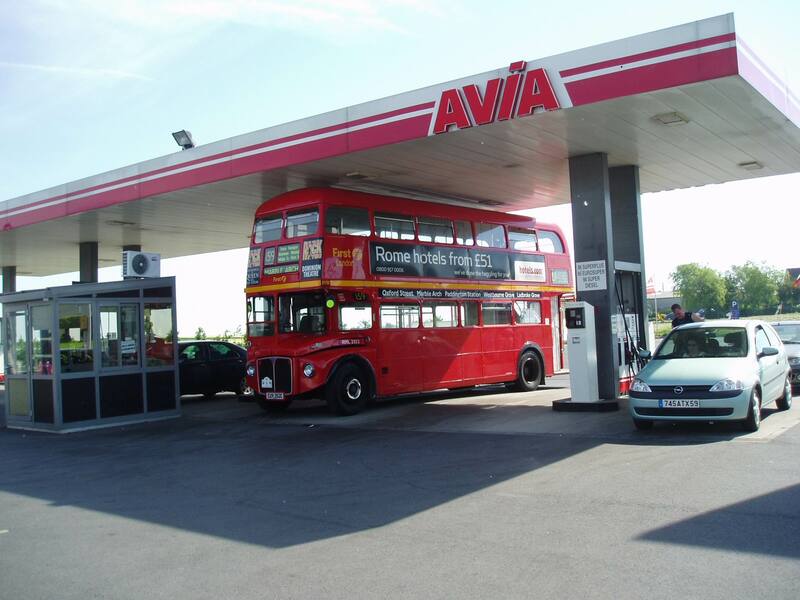 Contact was made with Steve Newman of Ensign Bus, the company charged with handling the disposal of buses as each route had its Routemaster fleet de-commissioned and replaced with new vehicles. Several visits to Ensign at Purfleet, conversations with Steve and online research narrowed the search to our preferred model, an RML. 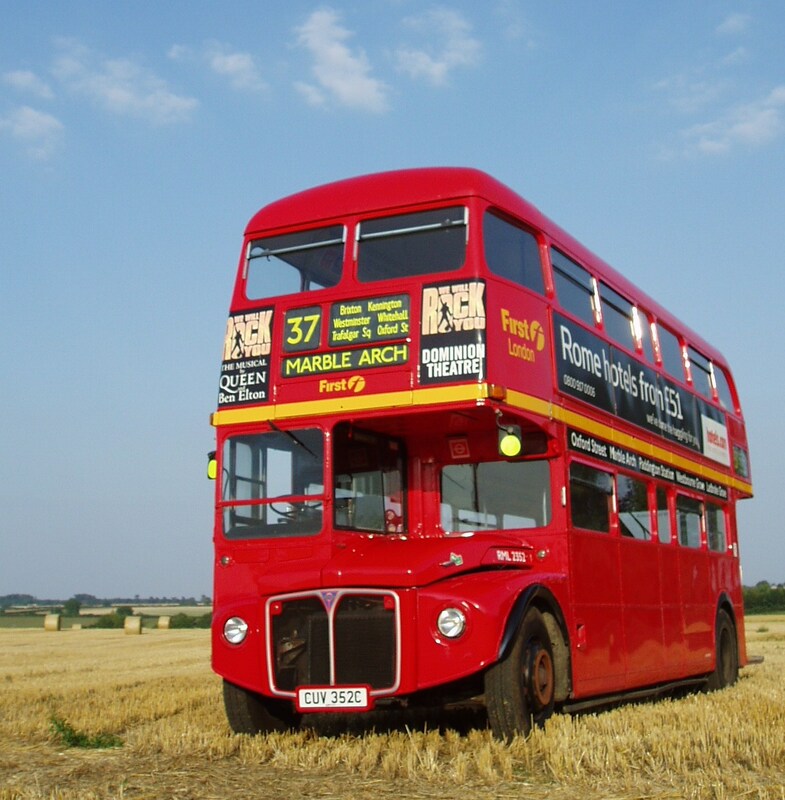 At 30ft the ‘Routemaster Long’ is 2ft 7ins longer than the standard RM and more pleasing aesthetically than its shorter cousin. 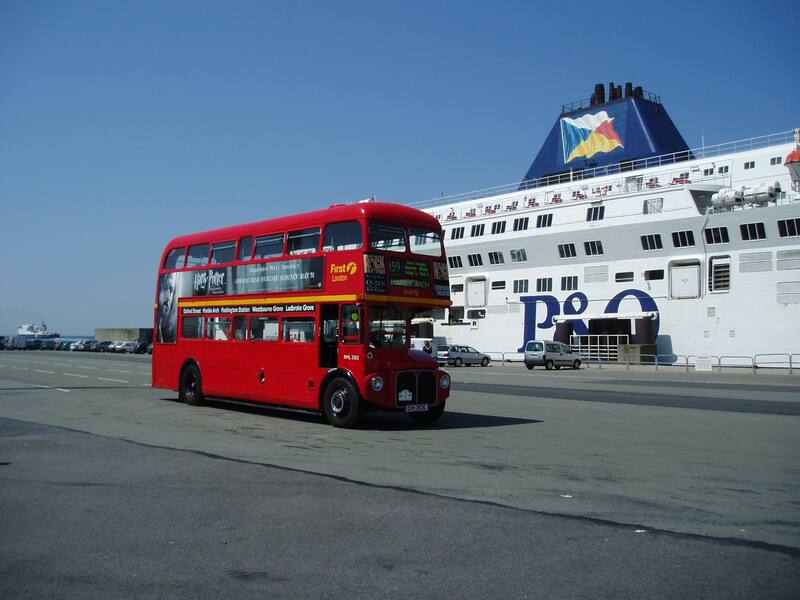 The RML seats 72 people, eight more than the RM and is instantly recognisable from the side by its additional small centre windows on both decks. 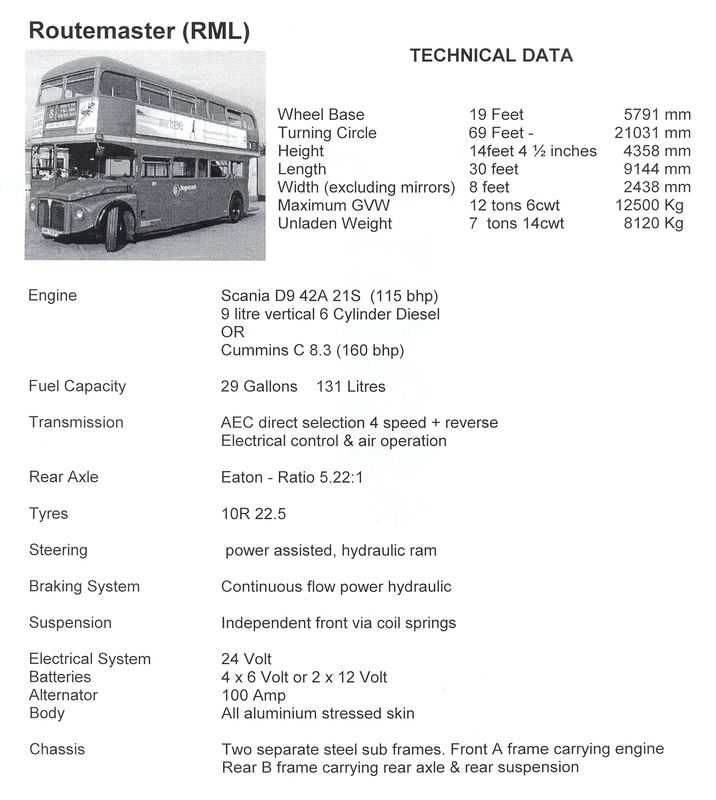 We also wanted one powered by either a Scania or Cummins engine, the other option being an Iveco which we had been warned off for various reasons, not least because it didn’t sound like a Routemaster! 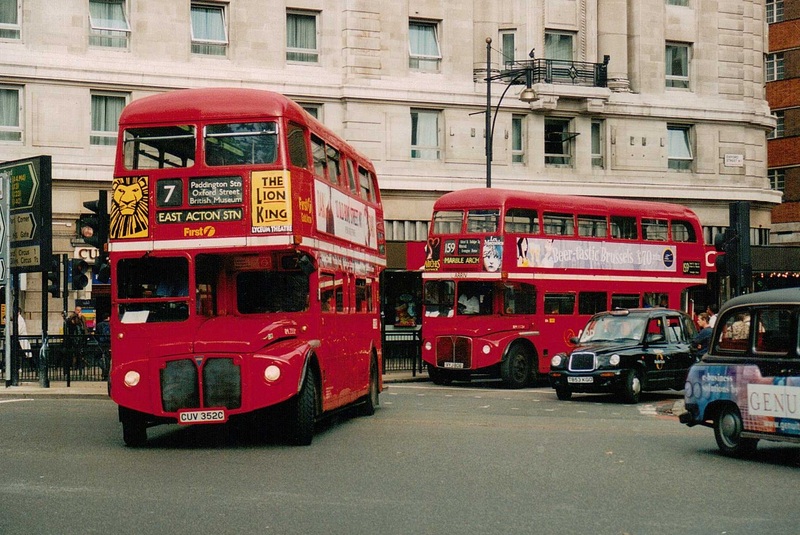 (The Routemaster fleet was re-engined during the early 1990s as the original AEC units needed replacing). 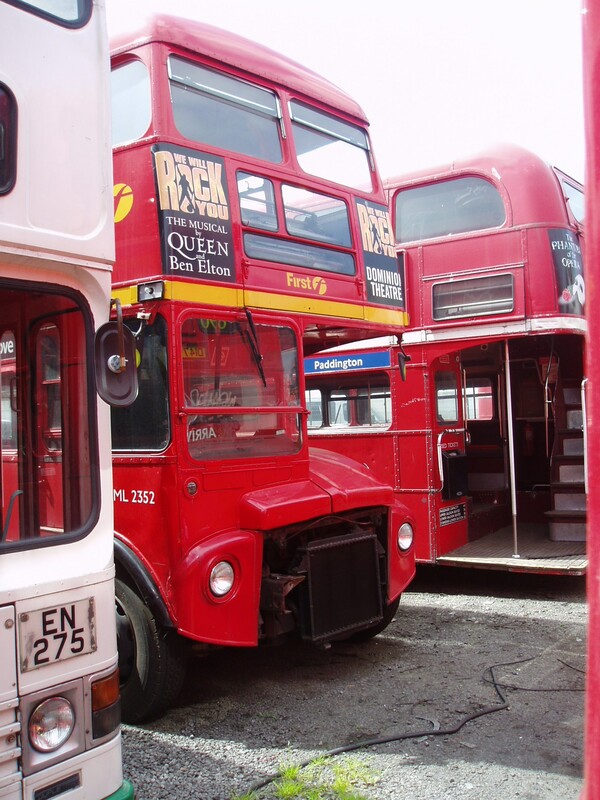 We eventually found RML2352 languishing in a yard packed with old buses. It was in less than perfect condition, but it appeared as though it wouldn’t take too much TLC to get it roadworthy and apart from a gearbox failure (!) on the day we were due to collect it, took delivery the following week – 18 July 2005. Less than a year later and with the promised height clearance, we took part in the 2006 Guild Classic to Ypres in Belgium. Fill ‘er up Jean Claude! 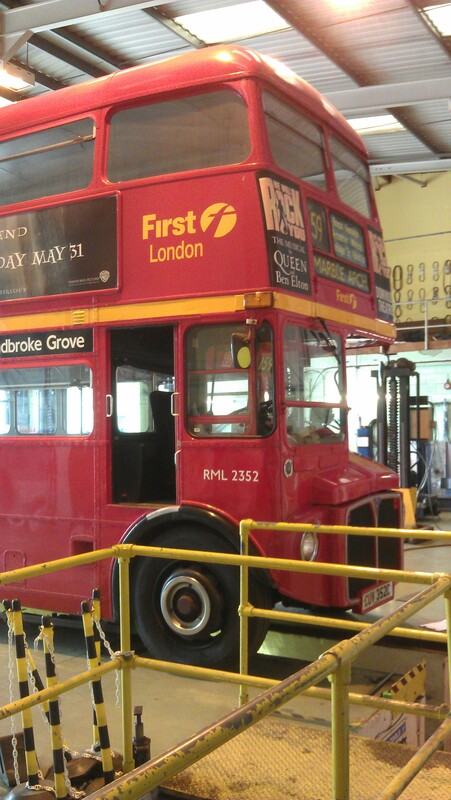 Today RML2352 is as they say in classic bus vernacular ‘in preservation’. Classed as an historic vehicle, it benefits from being free to tax and is insured complete with roadside breakdown cover for a relatively modest annual premium. This restricts it to carrying just eight passengers, but can be driven on a car licence! At a time when we all have a smartphone, it’s easy to believe that anyone can be a good photographer. But achieving great photographs that work for your brand and communicate your key messages needs thought and consideration. In today’s media savvy world, photography is essential both in print and increasingly online. It used to be important for accompanying press releases or marketing collateral, but now strong images are also needed to attract and engage socially via Facebook, Twitter, Pinterest et al. In this blog we’re going to look at the basic requirements for commissioning photography primarily for print, and a future blog will look at creating ‘Images for the Internet’. So here are 10 Top Tips to help you achieve successful images. Only then can you properly brief a photographer to achieve what you’re after. Have a vision for the images you want to achieve – even source some examples – so you can discuss this with them in advance and they can tell you whether it’s realistic. Work with a photographer who has the experience you need. Start by having a good look at his or her folio or website. Make sure they have the experience you require by subject – people, fashion, still life, sport, automotive, interiors, reportage etc – and see whether they are best suited to working on location or in a studio. Just because someone did a great job of your sister’s wedding pictures doesn’t qualify them to take action sports shots. Remember these two sayings: ‘A picture is worth a thousand words’, and ‘Every picture tells a story’. This is especially true today. We are all now ‘time poor’, and with so much information available to us through so many different channels, everyone’s attention span is getting shorter. Faced with hundreds of different stories, editors often select images they think will look good on the page and then decide on the copy. Help them by providing images that will enhance the look of their publications and websites – and get your story featured! 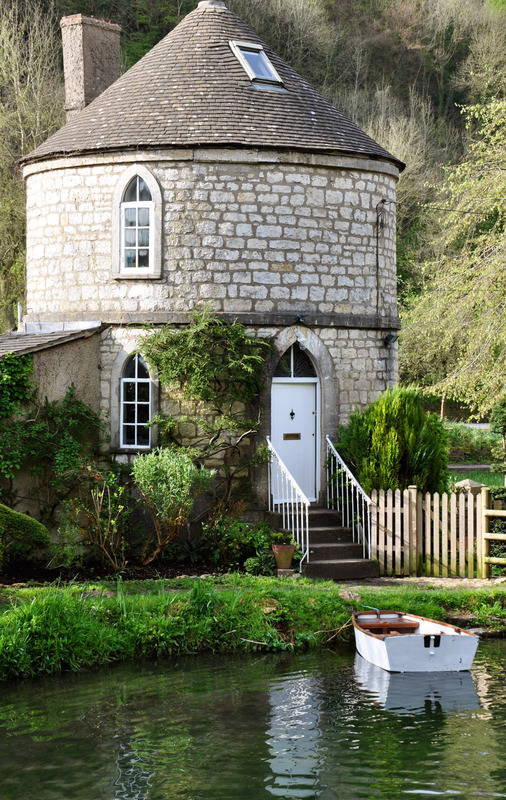 Waterside homes are a firm favourite with property journalists, and the rowing boat helps set the scene and tell the story. Remember that the subject or product has to be the hero of the image. A creative shot may look great, but will people focus on what you want them to see or just an overall impression? Also choose a background or location that complements the subject and helps communicate the story. 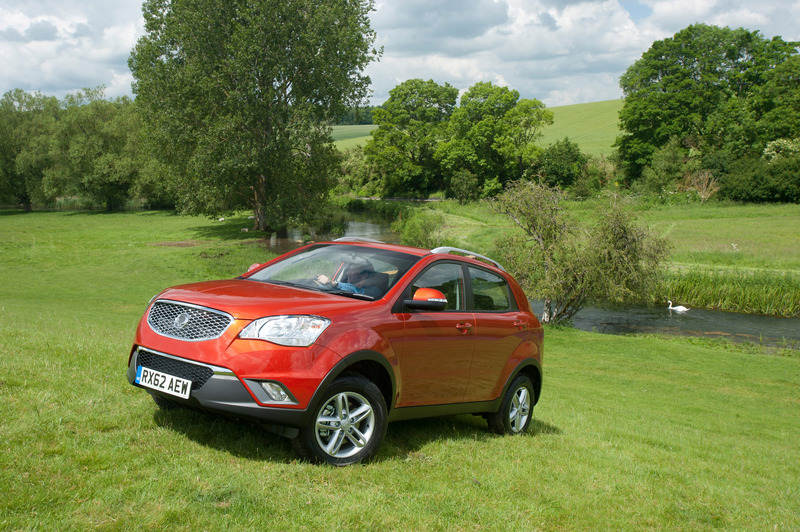 We needed a commercial background to promote this van version of the Korando 4×4. 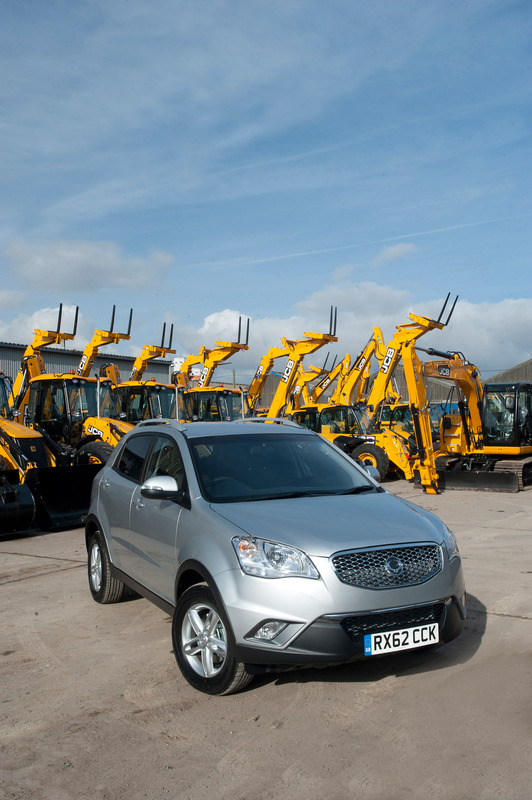 While providing an attractive backdrop, the line up of JCBs also added to the story. This portrait shaped image was designed as a possible front cover. The more different and varied images you can produce, the more likely an editor is to find a shot they like. Remember to provide different angles, as well as shots that can be used as cut outs. 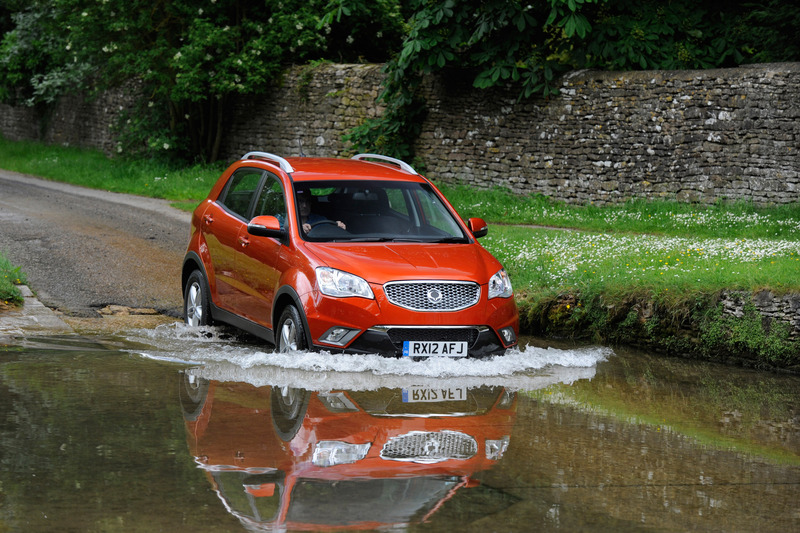 These two shots were part of a series to illustrate this new off-road vehicle; both have featured widely in the press and online. 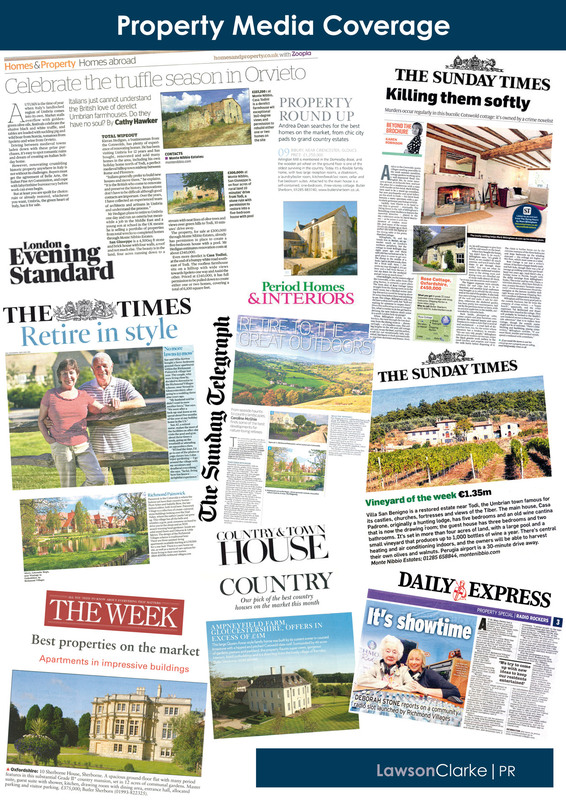 When briefing photography for print media it is worth considering the format needed to maximise your opportunities. Not every shot needs to be landscape (horizontal), and be sure to include some portrait (vertical) formats for possible use as a magazine front cover – editors often struggle to find images that are the right shape. Remember to allow clear space at the top of the image for the publication’s masthead/title to be printed, as well as at the bottom or the side for cover mentions. Think about the way the shot could be used. If it’s for a possible double page spread (DPS) think about where the gutter (space between the columns of text) or spine (central crease) will fall on the image. You don’t want a person’s face or a company’s badge or logo falling into this area. It’s easy to create the same-old clichéd images such as pictures of two businessmen in shiny suits shaking hands as they agree a contract, hand over keys or receive an award. Try and come up with something a bit different that will grab the editor’s attention and leap off the page. 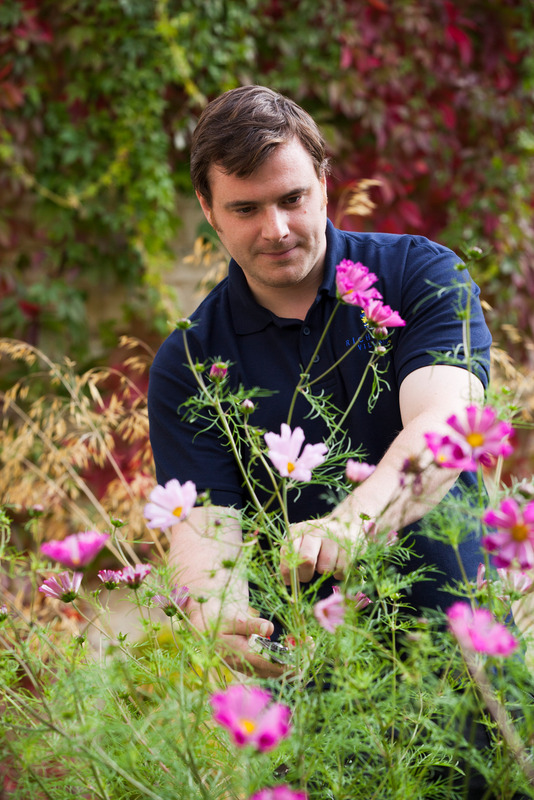 When Owen Vaughan, head gardener at Richmond Villages Painswick won an RHS Gardening Excellence award, we wanted a shot of him doing what he does best! This needs to confirm the objectives, the type of images and their purpose. Confirm the venue – location or studio, any props, models and materials required, as well as the budget. See for yourself what is and isn’t achievable. By actually looking through the lens and reviewing the images with the photographer as the shoot progresses, you’ll learn about important things such as light, shadow and background. This will also help ensure you get the pictures you’ll be happy with. Keep looking and questioning to see what might be wrong. For example, if a car is being driven, is the driver wearing a seat belt? If people are involved, are they smiling, grimacing, wearing sunglasses or light sensitive glasses that darken in bright light? Avoid these at all cost! While retouching is always an option, you want to avoid the expense of a re-shoot. Another blog in the near future will look at creating ‘Images for the Internet’. There’s a lot of hype surrounding social media, and for many people, still much confusion. To help get you started and ensure you get the most out of it, here are a few thoughts and ‘top tips’. 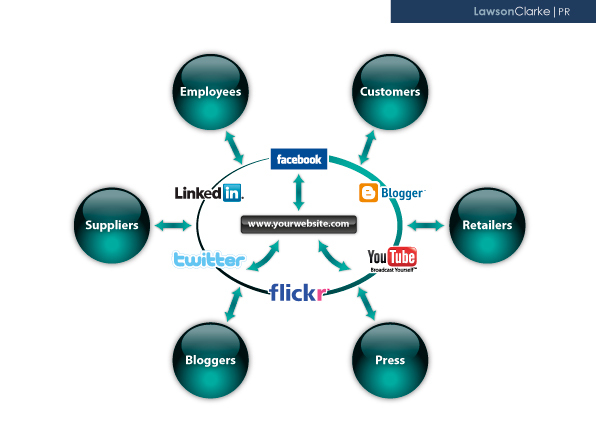 Social media – or Online PR – is simply about having a conversation on line. Both speaking and listening. Many dismiss it – and especially Facebook as being just for kids, but collectively it is now a highly regarded form of business communication. The key advance over traditional media communication is that it provides the opportunity for a two-way discussion with your stakeholders, not a one-way broadcast. Traditionally PRs wrote press releases and spoke to journalists, but now journalists and their readers – your customers, are online, too. The blogger has also arrived on the scene. These can be journalists, politicians, opinion formers and pundits, or simply enthusiastic private individuals who write about things that interest them, become authoritative in their chosen subject, and because of what they are saying attract an audience. The channels? Many and various but primarily Twitter, Facebook, blogs, YouTube and LinkedIn. Social media isn’t about trying to sell you anything. There isn’t an online shopping basket or PayPal page. It is all about conversation, reputation and hearing what people think. Imagine dropping into the pub for a drink or having friends round for a meal. It’s not long before someone is recommending or deriding a product or service. Reputations are made or lost based on third party endorsement. So just ask yourself the question: do you know what’s being said about you, your product or brand online? And if not, don’t you think you ought to be finding out by listening in? Much of this relationship building work is what has been achieved by traditional PR for years. The key difference is that now you can listen and converse directly and immediately. Change happens, and arguably as in the case of social media, it now happens extraordinarily quickly. Getting used to new ideas and new ways of doing things is just part of everyday life. How did we cope before e-mail? 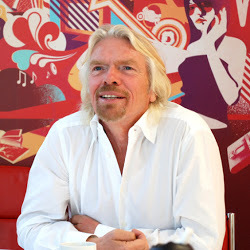 What business operates without the internet, and who doesn’t use a Blackberry or smart phone? All have arrived and impacted on life in just a few years. The way we communicate and do business evolves, and social media is just another new way of talking to your stakeholders, albeit in a very open and potentially global way. There are numerous computer tools and smart phone applications (apps) available to help, but to get going, we would recommend using Twitter, possibly Facebook and setting up a blog; YouTube if you can create or have access to relevant video footage, and LinkedIn is useful for professional networking. Generation Y cut its teeth absorbing significant amounts of information from multiple sources – more so than any previous generation. There’s less time for in-depth reading and attention levels are diminishing. The 140 character tweet, images, video clips and web links are now the order of the day. Short and punchy: just like a good newspaper headline. Why are you going online? What do you want to measure, and how often? Dip a toe in. Set up profiles, then watch, listen and learn. You’ll soon feel ready to join in. Engage when you feel ready. As with many things, the more you put into it the more you’ll get out. Use it to network, to conduct research and find out what people think. It’s also valuable for accessing news, from topics of global importance to what’s happening in your neck of the woods, geographically or professionally. You can search for any topic. If you understand the basic principles of media communication you’ll be fine. The same rules apply as for writing a press release. News is still the number one reason for engaging, so be concise, keep the language simple, direct and to the point, and avoid overt advertising puffs. If writing corporately, avoid personal views and opinions unless expressed as a statement from the company. Check spelling and grammar and keep it clean and legal! The law applies to online just as it does to printed media. 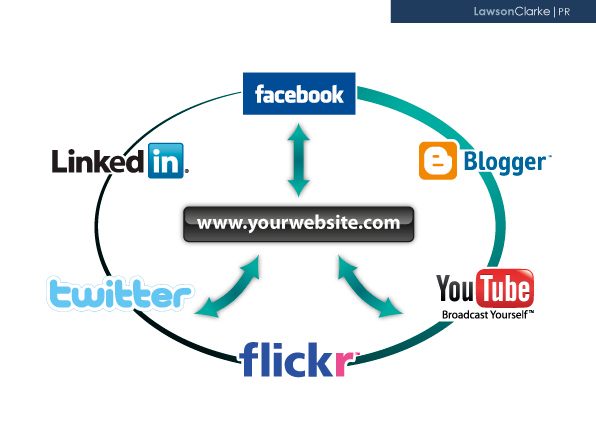 Make sure you include links to – and from your website, blog, online press office and all social media locations so there’s a virtuous circle. Add hyperlinks to the sign-off of your e-mails, and include the addresses on promotional literature, signage etc. Here’s the good news – it’s free! Well it is if you do it yourself. If you employ a consultant to advise or manage it for you, expect to pay for their time, and only you can put a value on that and decide. Online PR – as with traditional PR, is fundamentally about reputation and relationship management, so a PR consultancy with social media experience or a specialist social media agency is where to head for, not a website designer or online marketing agency. Just grasp the nettle – Don’t be afraid, you’ll soon be a natural! With several thousand PR consultancies operating in the UK, choosing one that’s right for you can be difficult. Jeremy Clarke has worked on both sides of the client/consultancy fence, and now as managing director of LawsonClarke PR – one of the longest established PR businesses in the West – shares a few thoughts to help you find the best consultancy for your requirements. While it’s not vital that you become best mates with members of your new PR account team, you will be working closely with them, so it is important that you like the people and enjoy their company. Don’t underestimate the power of chemistry to get things done. Visit your prospective consultancy’s offices and get a feel for who they are and how they operate. Check out the culture – will it mesh with your business and the way you like to work? Look to find a consultancy you can work with in the long term, even if you only start with an initial project. You will get the most out of them as their knowledge of your business, its products or services, market sector and media develops. To get the best work out of your PR consultants – as with any member of your own team – try to make them feel valued and motivated. Regard them as a partner, not just a supplier. Trust – both ways – is just as important as results, so take them into your confidence. The financial return versus the cost can be difficult to assess, but the value a good consultancy can deliver can be priceless. Learn to trust their judgement, even when it comes to the budget. For example, they will know that although good press photography might cost more than a quick snap taken by someone in the office, it could make all the difference in terms of achieving quality coverage. Not only will a bad photograph be less likely to be used, sending out poor quality materials will undermine your reputation and a journalist’s perception of your brand. Decide on a sensible budget that works for both parties, and remember the adage: ‘pay peanuts and you’ll get monkeys’. Creative people thrive on encouragement – so while new ideas need to be relevant and appropriate, do keep an open mind to their suggestions. Tap into your consultants’ creativity – they can be an invaluable resource in this area so make time to develop new and different ideas, and don’t stay stuck in the same old rut. Brainstorm! It’s the perfect way to kick-start new ideas, and by getting away from your usual surroundings, the change of scene will help stimulate right brain thinking! Decide how much thinking you want your new consultancy to do. By being objective, they should be in a unique position to help you form a strategy, and by contributing to the success of your business on a number of levels, will be far more engaged and committed. Make it clear how much support you are looking for. It is worth remembering that if you just use your consultancy to act on a tactical level you’ll not be maximising their full potential, and will miss out on getting real added value. It’s the consultancy’s responsibility to be on time for meetings, but in this day and age of instant communication, it is no longer vital that they’re based in your immediate locality. With increasing numbers of journalists working freelance or from home it’s not necessary to have a consultancy based in central London, either – plus selecting a regionally based company will save you money. It has been said that some clients spend more time choosing their next car or mobile phone than they do on selecting a consultancy, but it is wise to think carefully about what you want them to achieve. Draw up a list of PR objectives and requirements and first do your research. Also look at their client list, the sectors they work in, and ask about professional recognition. Be SMART – make sure your objectives are Specific, Measurable, Achievable, Realistic and Time-bound. It might be a great PowerPoint presentation with all the whistles and bells, but great sales patter needs to be balanced by knowing who’s going to work on the account and how they are going to deliver. Make sure you’re not just looking at the new business ‘getter’, and ensure the proposed account team is present. If in doubt, go and see them at their offices; find out who really will be doing the work. Don’t ask too many consultancies to pitch. From a long list of, say, six choose no more than three. Any more than that and people will start declining. Alternatively, visit a few consultancies for a ‘chemistry meeting’ and ask one or more to do some project work. Find the one that works best and move forward with them. Most corporates now follow some form of purchasing process and involve procurement or buying specialists. Remember that you are sourcing soft skills and people, not widgets or materials in bulk, and some of the ‘one size fits all’ purchasing processes simply don’t work. Some consultancies have had such bad experiences that they now decline to work with companies that make too stringent demands. PR is a people business, and providing the consultancy meets your objectives, trust your intuition. Many large companies insist on a re-pitch every 2 – 3 years. This can have advantages in terms of getting new ideas, reviewing “who’s out there”, or simply re-focusing your incumbent consultancy. But a committed agency with several years’ knowledge of your business, sector and media can be doing a great job, and could be easily re-focused – if that’s what’s required – in a more efficient way. Remember, your existing consultancy already has well-established press relationships – something it might take your new agency time to form, so don’t change just for change’s sake. – why are you looking for a PR consultancy? – what do you want them to achieve? – how much involvement are you looking for? – how long do you want to work with them – a project or programme? 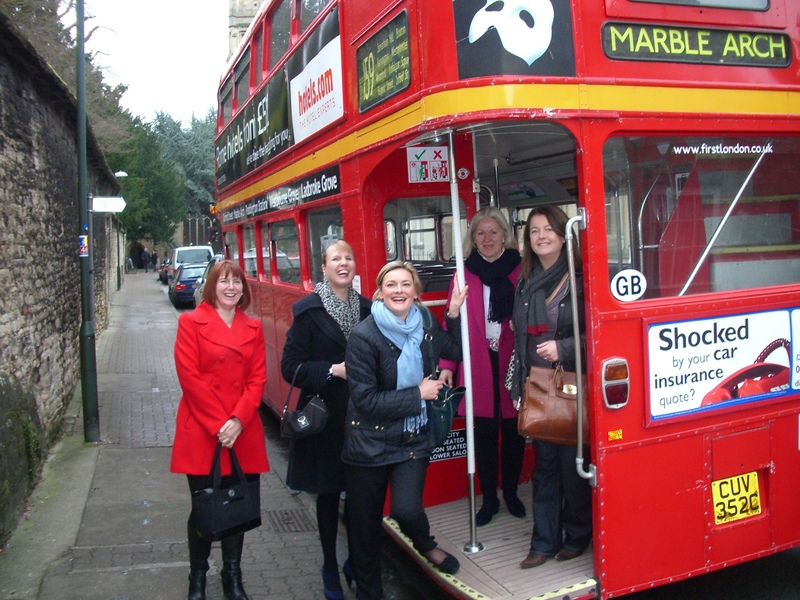 – what size consultancy would suit your needs? – how much can you afford? – how well do they promote themselves & communicate what they do? – what clients do they currently work with? – how well do they know your target media? – do they understand social media/online PR? – can they give examples of best practice/creativity/teamwork/results? – how long have they been established? – what is their employee turnover like? – how long have they worked with their longest standing client? – what do they know about your business, market sector etc? – who, and how many people will work on the account?